For many, if not most, the tireless job of a collegiate assistant coach is a stepping stone to a head coaching position. And to be sure, every great coach has a “coaching tree” of head coaches who once worked for them. For others, however, the job in itself is a career. Some assistant coaches are as vital to a program as the head coach, and it would be hard to imagine a team running without them. So it is no surprise that some of the most successful programs in Division I history have retained assistant coaches for a decade – or two or three. Members of this elite group are their head coach’s right hands and co-pilots. Their duties are many and their rest is hard to come by, but their hearts are big for the head coach, the players and the program. 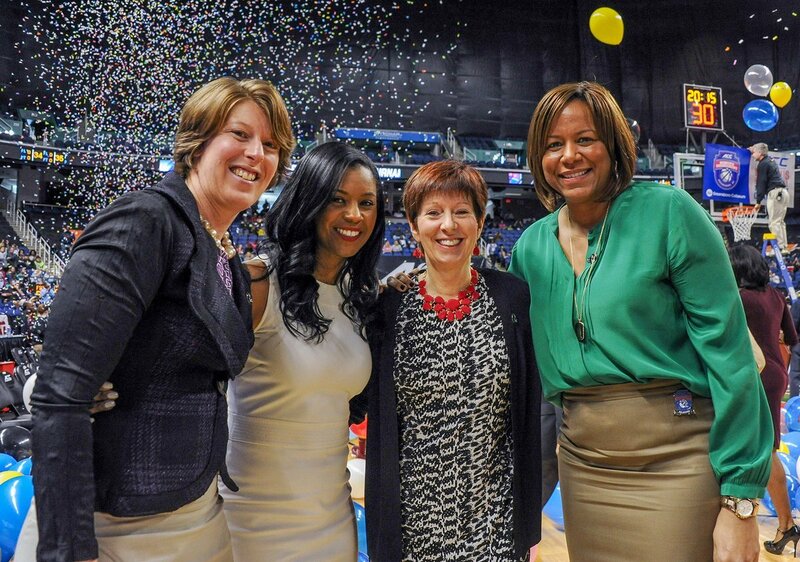 Niele Ivey and Carol Owens have coached with Muffet McGraw for combined total of 31 years. Photo courtesy of Notre Dame Athletics. Coach Muffet McGraw has seen her share of players come and go in almost 33 years at Notre Dame’s helm, but the same can’t be said of the Hall of Famer’s coaching staff. Associate head coach Carol Owens is in her 19th year with the Irish, and McGraw’s former point guard, Niele Ivey, is in her 12th season as assistant coach. 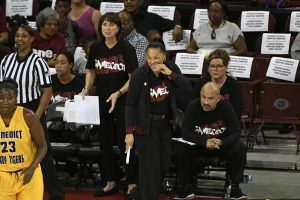 Both were part of the program’s two National Championships – Owens as a coach and Ivey as a player – in 2001, and then in last year’s improbable title run after an injury-plagued season. Owens was first hired in 1995, and helped recruit Ivey to South Bend. She was head coach at her alma mater, Northern Illinois, from 2005-2010, when she returned. Ivey came aboard in 2007, after injuries shortened her WNBA career. To say the staff has a family feel is an understatement. Owens said she will always be grateful to McGraw for hiring her for her first-ever coaching job. 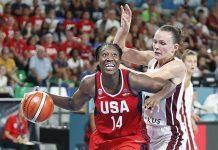 Her first assignment was to land highly-recruited Ivey. “She said, ‘you have to get Niele,'” Owens said. Ivey began her coaching career for the Irish after a stint as an assistant coach at Xavier. Initially she was a recruiter, because McGraw knew she had an eye for a good-fit player. Over the years, Ivey’s role has shapeshifted into other areas. Owens is referred to as “the enforcer,” for taking the hard stance with athletes, when necessary. It is a role she embraces. She said she “can take” being the enforcer. Ivey is more of a player’s coach. It has been quite a journey from playing for McGraw to working with her. Ivey said she has learned a lot. 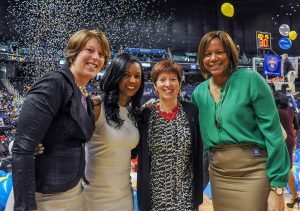 Assistant coaches Beth Cunningham, Niele Ivey; head coach Muffet McGraw; associate head coach Carol Owens. Photo courtesy of Notre Dame Athletics. 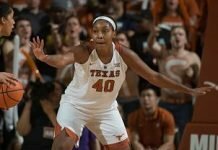 Owens said she “tries to take as many things off of the head coach’s plate” as possible. It means the world to McGraw. McGraw said the secret to a successful coaching staff is finding balance. Last season saw four Notre Dame starters suffer year-ending injuries before conference play, yet still ended in a Championship. That bonded the coaching staff, which also includes former Irish guard Beth Cunningham, for life. McGraw said she and her coaches had to lean on each other throughout the season. Every spring when head coaching jobs become available, speculation arises that Ivey will take one of the positions. She said any new job would have to be an exceptional fit. 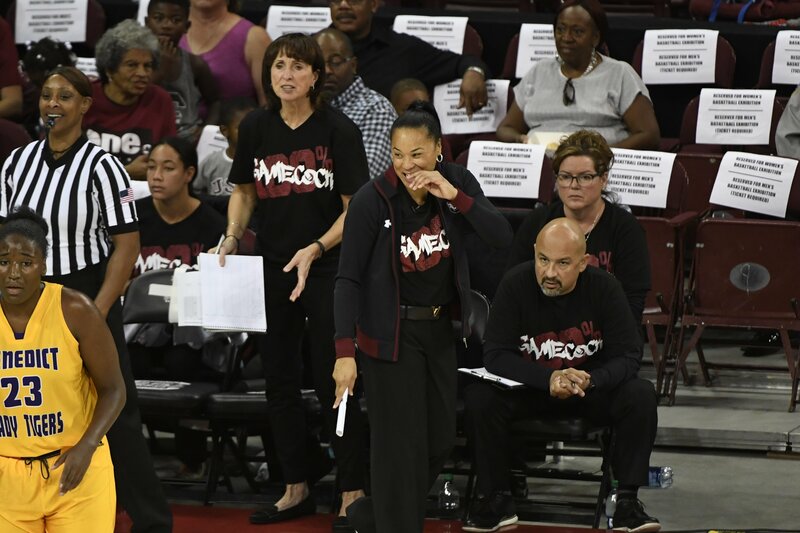 Associate head coach Lisa Boyer and head coach Dawn Staley both stand at the end of a game. Photo courtesy of South Carolina Athletics. Lisa Boyer might be the first associate head coach to have once coached the head coach. Dawn Staley was Boyer’s star point guard for the ABL’s Richmond Rage from 1996-1998. 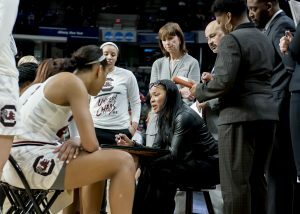 When Staley took her first head coaching job at Temple in 2000, she contacted Boyer to be her assistant coach right away – even though Boyer was then coaching the WNBA’s Cleveland Rockers. Staley was playing for the WNBA’s Charlotte Sting while coaching the Owls, but she always had time to pester Boyer. Boyer joined Staley at Temple in 2003, and followed her to South Carolina five years later. Their title goal was realized in 2017 when the Gamecocks won the National Championship, after nine seasons of hard work that began with a rebuild of the program. Part of that reconstruction happened after Boyer suggested her friend change her approach in working with student-athletes to be more collaborative. The rest is history. Staley said her resolution to hire Boyer wasn’t based on their friendship. Coming to South Carolina was a challenge, to put it mildly. Boyer helped Staley understand how to parlay her vision to her team. Staley said Boyer fulfills many roles, and differs from her in a complimentary way. Dawn Staley conducts a timeout under the eye of Lisa Boyer. Photo courtesy of South Carolina Athletics. Their differences play out into coaching very well. Both say that the honesty in their relationship is what makes it work. Boyer said she always saw great potential in Staley, and is not surprised by her success. “I used to tell her she’d be a really good coach. She’d say, ‘I don’t want to be one of you.’ Now she is,” Boyer said. Associate head coach Johnnie Harris and head coach Vic Schaefer conduct a timeout. Kelly Price/Mississippi State Athletics. When Vic Schaefer took the head coaching position at Mississippi State in 2012, after 15 years as an assistant coach, he knew he had to bring someone with him to make it work: Johnnie Harris, whom he had coached with for eight years. They arrived in Starkville as a package deal. 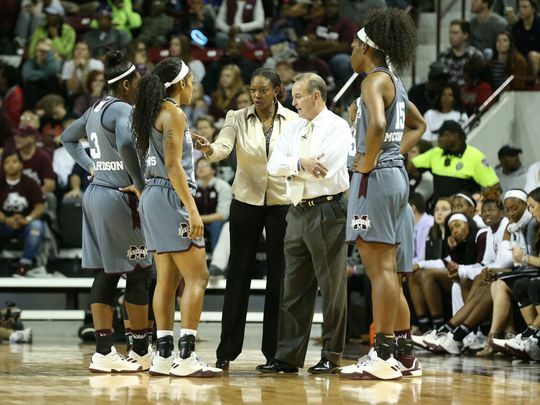 Under Schaefer, the Bulldogs went from SEC bottom feeders to elite status in relatively short order, and were National Championship runners-up in 2017 and 2018. He and Harris work symbiotically on the sidelines during games, often conducting dual coach timeouts, and conferring constantly. Harris said they see eye to eye, which begins with a shared love of the same style of play. Harris said her duties as associate head coach are diverse. That duty is of the utmost importance. Schaefer’s trust in Harris is unwavering. Both are extremely competitive and want to win, but they differ in other ways. 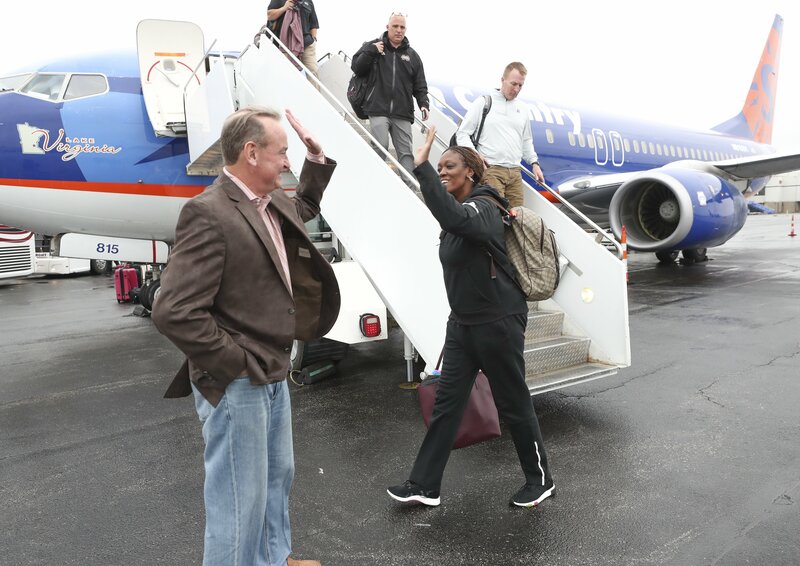 Vic Schaefer and Johnnie Harris high-five upon arrival in Columbus last March for the Final Four. Kelly Price/Mississippi State Athletics. Schaefer appreciates the balance that Harris’ presence brings. As Mississippi State prepares to battle for SEC bragging rights in the season’s closing weeks, Schaefer and his team stand on a granite foundation. Chris Dailey is honored before a game last fall for her induction into the Women’s Basketball Hall of Fame in June. Photo courtesy of Connecticut Athletics. If there is a gold standard for longtime assistant coaches, it is called Chris Dailey. Geno Auriemma hired her in 1985, shortly after he was named Connecticut’s head coach. Each had short-term goals in mind, with no idea of what the future in Storrs would hold. 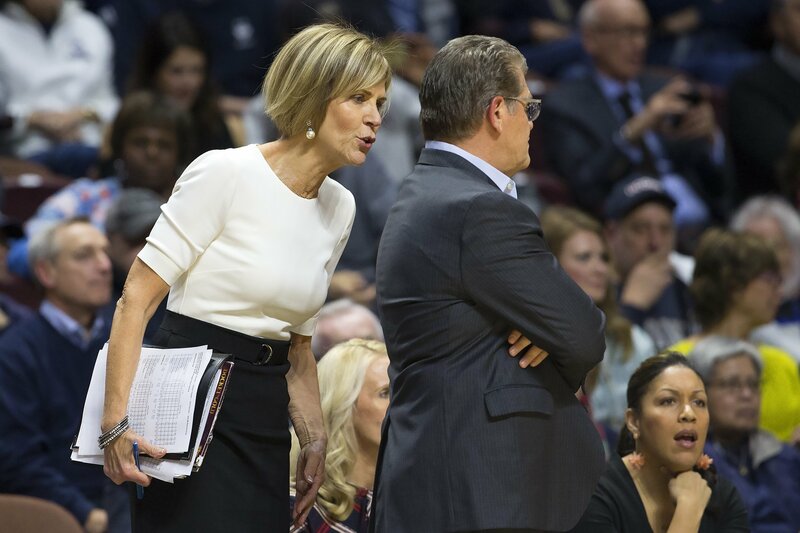 More than 1,000 wins, 47 conference titles and 11 championships later, Auriemma and Dailey have co-created a dynasty that has yielded countless All-Americans, and more professional players than any program in women’s basketball history. 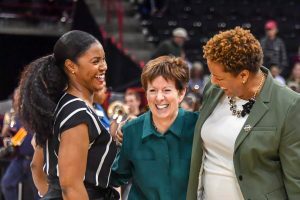 Last year Dailey became the first assistant coach to be inducted into the Women’s Basketball Hall of Fame, and a handful of former Huskies flew to Tennessee for the ceremony, including the Seattle Storm’s Sue Bird and Breanna Stewart. 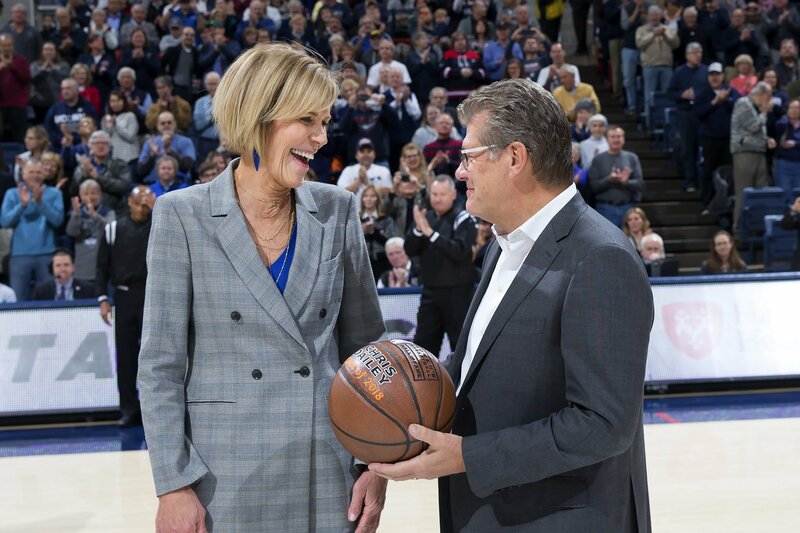 Her value to Auriemma is just as immeasurable. At the 2016 Final Four, when he was presented the national Coach of the Year award, Auriemma stunned the newsroom into silence when he became teary-eyed and said he couldn’t have done what he’s done without Dailey. Dailey’s background was in teaching. At UConn, she learned to diversify her strategies. Chris Dailey talks to Geno Auriemma on the sidelines of a game. Photo courtesy of Connecticut Athletics. Dailey and Auriemma’s relationship has worked because their personalities clicked, allowing them to grow together. 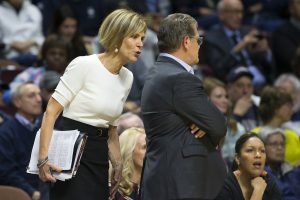 Early in her tenure, Dailey said she realized Auriemma was giving her tasks that he didn’t want to do himself, including scheduling. Auriemma said their differences spring from the same values and vision, and from their complimentary symbiosis. “From the beginning, it was always about that we share a similar view of how a program should be run, how it should look, what characteristics we want in a player and what standards we want to hold our players to,” he said. Dailey said she appreciates Auriemma’s trust. Auriemma said the Husky program wouldn’t be the same without Dailey’s influence. Accolades and titles aside, Dailey is amazed at the journey. 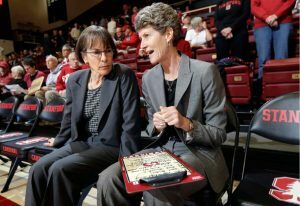 Tara VanDerveer and Amy Tucker confer before a game. AP Photo/Marcio Jose Sanchez. Amy Tucker was Hall of Fame coach Tara VanDerveer’s assistant coach from the time she was hired at Stanford, in 1985, until she retired from coaching at the end of the 2016-2017 season to become the Cardinal’s women’s basketball administrator. Tucker was promoted to associate head coach when VanDerveer was named coach of the 1996 Olympic team. Tucker served as interim head coach in 1995-1996, and guided Stanford to a Final Four appearance. VanDerveer said Tucker’s continued involvement with the program is a benefit to all.